Being a four-year veteran of clean eating and whole smoothie making business, I have not thought to add beets to my blender until late last year. I cook beets and add them to salads but raw beets?! I felt by not consuming raw beets we were missing out big time. We all hear many times that raw vegetables contain more nutrients and vitamins versus cooked. 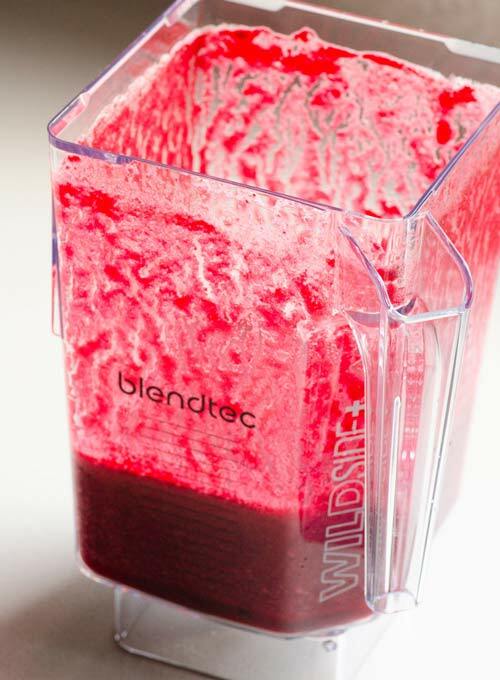 If you are a proud Blendtec owner, you can fix the situation easily and make this Glowing Beet Juice. It is just perfect for detoxing your liver as it contains foods like beets, apples, celery, kale and turmeric that do just that (Source). I've learned that health and beautiful skin start with nutrition and clean eating. I placed all the vegetables I have a hard time eating raw on their own in a Wildside+ jar and pressed “Whole Juice”. The end result was a delicious, refreshing juice without overpowering sweetness. It was just right. And as a nice bonus – my kids loved the beet juice! When it comes to beets, I prefer to buy young organic ones. If I am juicing I might as well get the most out of my effort – pure nutrients only with the least amount of pesticides. Also, I don't peel my beets, but I do make sure to rinse my beets. Add ingredients to FourSide or WildSide+ jar and secure lid. Olena is a fit mom of two; feeding her family delicious clean eating recipes that she shares with readers on iFOODreal. For simple meals without processed foods follow her on Pinterest, Instagram and YouTube. Love my blendtec blender. Did not use it a lot at first but now I Love this machine. I recently purchased the large twister jar and I love it as well. I modified this recipe to include part of a carrot. I added some ginger, small piece of jalapeno some salt and pepper. Omitted the turmeric because i couldn’t figure out how to incorporate oil to help with absorption. Pepper is supposed to help with that also. Put in freezer to cool. Sounds delish! Will try it!